Everyone’s desires and needs will be different. Work on what you find most interesting and useful first (the IndieWeb calls these itches). Make a list of what you use most often on your old social media silos or wish they had and work on that first. In a conversation with Greg McVerry last night, I came to realize what I’ve been focusing on and why. 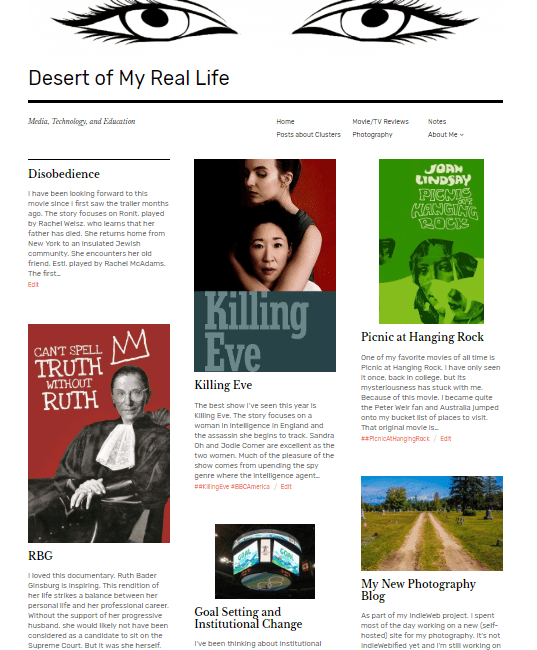 To understand my focus, I first need to explain a little bit about how I set my site up. I then wanted a place to post my photographs. I wanted the photos to be all together but separate from my blog posts. I envisioned a main page with small images and when a viewer clicked on an image, it opens in a larger format. I tried a number of different options (a separate page, a portfolio, a project) and realized that I didn’t like the way the Rebalance theme handles images. But WordPress doesn’t allow multiple themes on a single WordPress site. 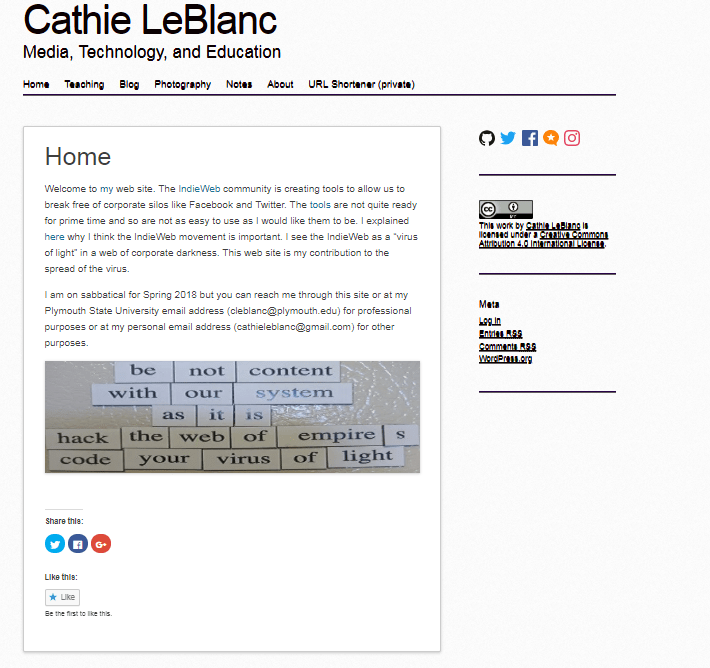 So I decided to install another instance of WordPress and link it to my blog WordPress instance. 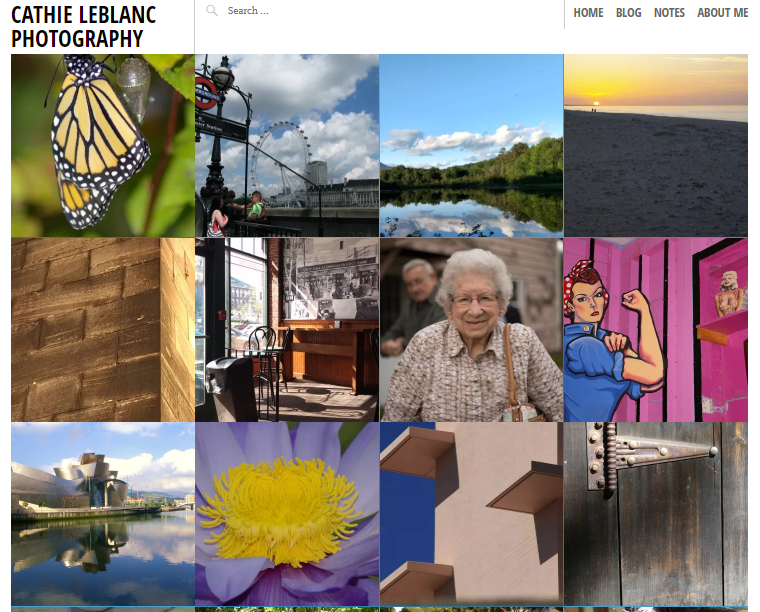 I settled on the Pictorico theme for my photography WordPress instance which you can see below (and here). This theme is also minimalistic and is in a grid format. When I post an image, I add it to the text of the post and I don’t add a featured image. Instead, the Pictorico theme uses the first image in a post as the featured image if one is not added. This means the image only shows up once on an individual post. As I was telling Greg about the four instances of WordPress that I have installed on my web site and why I wanted to use each one, I realized that I use various corporate social media sites for different purposes and the way they look and feel matters to their use. And so as I try to replace the use of the corporate sites with my own site, I want the various pages to look and feel different from each other in ways that are suited to my use of them. It’s a lot of work to set up and maintain four instances of WordPress but it’s worth it to me to get the look and feel that I want. And this realization made me wonder if we could develop a plugin or a theme that allowed one installation of WordPress to have a different look and feel on each page. We already can filter posts by type so that we can have a separate page for each post type. Could we allow those pages to look different from each other based on the type of post that was on each page? I have created a couple of simple themes using a Udemy class that I took in January but I would need a lot more knowledge and experience to begin to develop this idea. I wonder what other people think about it.